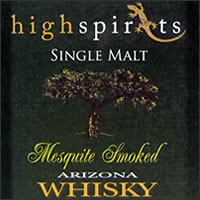 The Whisky Boys received an e-mail from Dana Kanzler of the Arizona High Spirits Distillery saying that they were experimenting with a Single Malt and wanted the Whisky Boys to review and comment on this new dram. 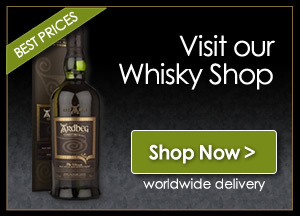 The Whisky Boys sent off our shipping address and sat back and waited for our sample. So in mid August The Boys received a parcel from the States, which contained a full size 75cl bottle of their new Whisky. This dram is made with two-row barley from Wisconsin, They cold-smoke 15% of the barley with local mesquite and add this to the base at mash-in. 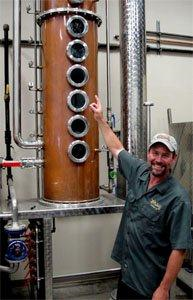 The wash is distilled using a rectifying column still with all plates by-passed to replicate pot distillation. The Whisky The Boys received was matured in oak casks at 152 proof on 2nd January 2008 and on 26th January 2011 it was removed from the barrel and proofed to 80 degrees. So this expression is just a few week over the three year barrier. Nose…A little antiseptic, a wee hint of smoke and not too strong, some grassiness. Taste…With water it is surprisingly smooth for a 3 year old, smoke is only very light, sweet, a slight herbal perfume, needs a little more smoked barley and a little longer in the cask to give it more complexity. Finish…Short to medium finish, leaving a warming glow, good as an aperitif. Nose…Not a lot on the nose, only the slightest hint of smoke, had to sniff hard to get the smoke, new fresh aroma. Taste…Smooth and warming, smoke has gone, a little vanilla sweetness and a wee touch of citrus. Finish…Medium finish, leaving a warm fresh palate, quite an enjoyable smooth finish. That was an enjoyable tasting, The Whisky Boys really enjoyed tasting something new and quite different, Jim thought that this dram is a lot better than some of the more recognisable quality Bourbon and if this became available in Scotland then Jim would certainly have a bottle to add to his international drams. Nicola was pleasantly surprised to how easy drinking it was and would order this in a bar over many other American Whiskies. The Whisky Boys thought that if the proportion of smoked barley was increased and the dram spent a couple of years more in it’s oak cask it may lend to a more complex Whisky, offering more flavours and giving a more delicate and mature taste. So to close, for this distilleries first attempt at producing a Single Malt it has quite a success on it’s hands, so very well done to all at High Spirits. This sounds like a promising brew; if it’s that smooth at three years I can only imagine what some aging would have done. Maybe High Spirits will take your advice and produce something similar with more time in the barrel! Either way, I’m excited about this.